TCD Green Incubator Hits the Ground Running! And that's a wrap! Last month we ushered in the inaugural TCD Green Incubator, which was a joint effort between TCD Plastic Solutions and Blackstone LaunchPad. A first of its kind in Europe, the event saw 20 teams compete for a grand prize based on their sustainable campus solutions and ideas for Trinity College Dublin. The event took place in the Innovation Academy, on March 26th. Winners Meryl Merran & Juliette Rontani, taking home top prize with their concept of a Trinity flask which can be combined with an ID card. Each team was selected through a competitive application process and had to present their idea on the night through the format of a quick-fire 3 minute pitch. Each team then had to answer 3 minutes of questions from judges Norah Campbell (Business Professor at Trinity), Matthew Moore (Entrepreneur / 4th Year Law & Business), and Brendan Tuohy (Chairman of Centre for Marine and Renewable Energy / UN Millennium Project). The audience was also treated to some very inspiring opening speeches from Brendan Tuohy and Matthew Moore, with closing remarks made by Norah Campbell. Judges Matthew Moore, Norah Campbell, and Brendan Tuohy. 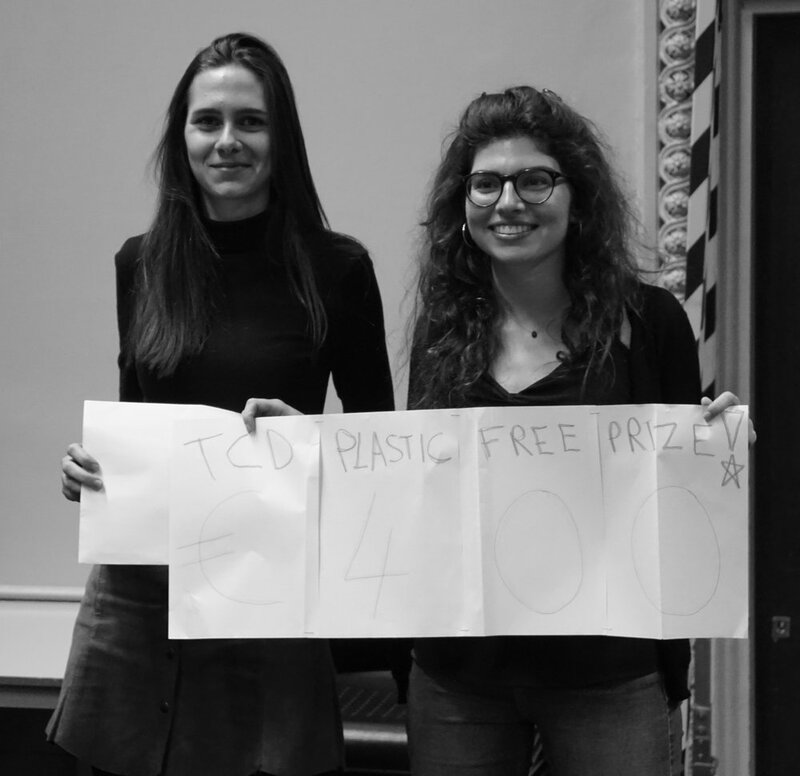 There were many great ideas on the night, but ultimately the €400 prize was secured by Meryl Merran and Juliette Rontani, who took home top prize with their concept Trinity Flask, which saw the combination of a plastic reusable bottle with a Trinity ID card. The winners will now work with Blackstone Launchpad to develop their idea further. Other notable ideas across the evening were Kezia Wright’s The Green Regime, a pop-up shop selling sustainable and non-perishable goods. Maeve Russell and Andrew Yague’s Trinity Bikes, who as keen cyclists, realised that Dublin Bikes does not have stands outside Dublin city centre with limits of use until 11.30pm. Trinity has laptop rentals, why not encourage students to rent bikes as an environmentally-friendly way to travel! And so, well done to all the competing teams and their involvement. It's certainly been inspiring to be around many enthusiastic individuals and we hope that you continue to pursue these ideas as well as other sustainable ideas going forward! And lastly, big thanks to the TCD Plastic Solutions organising team for their involvement: Gregory Arts, Edward and Joe. The great news is that there are already talks underway for a future TCD Green Incubator. Next year’s TCD Green Incubator event will link up with environmentally and entrepreneurially-minded students at NUI Galway and UCC (both of which have a Blackstone Launchpad programme already in place). So until an even bigger and better event next term, get idea-storming! See you then! Older PostBlackstone LaunchPad - March Update!